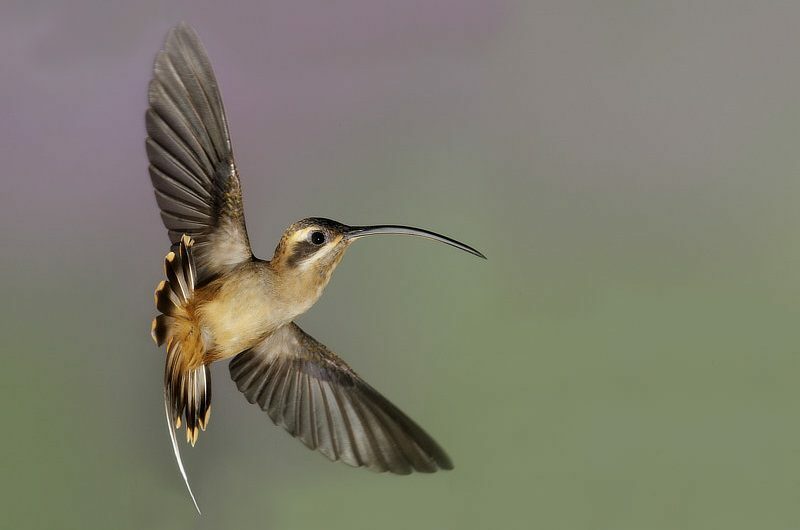 The long bill and long tail of the Long-billed Hermit make it a “large” hummingbird, at 15 cm in length. This species is well-named, as the bill itself is nearly 4 cm long! The Long-billed Hermit has brown upperparts and pale underparts; its cinnamon rump distinguishes it from other species of hermits in its range. It has a black mask with a white post-ocular stripe, and a long, decurved bill. It also has elongated central tail feathers with white tips. Hermits are distinctive, dull-colored hummingbirds with long, decurved bills. They live in the dark understory of Neotropical forests. They are trap-liners—instead of defending a territory, they make long routes through the forest and visit flowering plants along the way. These routes can be up to 1 km long! As they journey through the understory, they give a loud “sweep” call, announcing their presence. Like other hummingbirds, they feed on nectar and consume insects and spiders, especially during the breeding season. They feed on nectar from Heliconia and passion flowers (Passiflora), among others, and have a key role in pollination, as some flowers have adapted especially to their long, curved bills. Males sing in leks with up to 25 birds. They lek throughout most of the year to attract females to mate. Leks are easily detectable, as males singing from a perch give a sharp “whik”, repeated every second, and wag their tail, signaling with the white tip. Females select the best singer to mate. Like other lekking birds, after mating, males do not partake in parental care and females are responsible for nest building, incubating and raising the young. The female builds a nest of dried grasses and moss, attached to the underside of a palm frond or Heliconia leaf 1.2-1.5 meters off the ground. She lays 2 eggs and incubates them for 14-19 days, and young fledge after 18-28 days. Long-billed Hermits are common in the lowlands and lower foothills, where they are found in primary and secondary growth rainforests, and are fond of edges and streams, along with plantations. They are absent from the dry Pacific lowlands. Long-billed Hermits range from Mexico to northwest South America (Colombia, Venezuela and Ecuador). They are common at the Canopy Tower feeders, where they sneak in and feed quickly before getting chased off by a territorial hummingbird such as a White-necked Jacobin or White-vented Plumeleteer. At the Lodge, they are replaced by Stripe-throated and Green hermits, and at the Canopy Camp, the similar Pale-bellied Hermit takes its place. A Recent Species: The Long-billed Hermit was formerly considered a subspecies of the Long-tailed Hermit complex, where it was known as the “Western Long-tailed Hermit”.